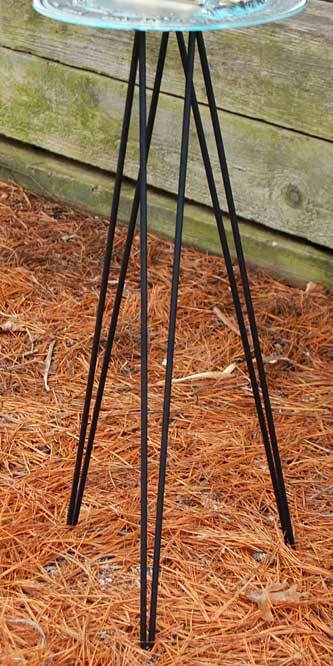 Add a contemporary base to your classic horizontal sundial with the Rome Black Wrought Iron Hairpin Sundial Pedestal. The three, thin legs, steel construction, and black color on this piece create a modern silhouette, and offer a wonderful display for your existing Rome horizontal sundial (not included). The three legs each evoke a hairpin, thanks to their "V" shape, and the slight curve at the bottom of each ensures a stable support. A 3" diameter, flat steel disc completes the unit, and a hole in its center creates a secure mounting spot for your sundial. Its 24" height elevates your dial to the perfect viewing spot, and the painted black finish protects the stand from the elements. Showcase a classic timekeeper in a modern way with this Black Wrought Iron Hairpin Sundial Pedestal. Rome Wrought Iron Scrollwork Pedestal, Black, 24"
Rome Stainless Steel Sundial Pedestal, Silver, 32"
Rome Steel Forma Industrial Pedestal, Antique Gray, 24"
Rome Wrought Iron Rose Pedestal, Rust, 28"
Rome French Topiary Sundial Pedestal, Antique, 25"